As a San Francisco Bay Area Built-up Roofing Contractor, Wedge Roofing provides expert Built-up Roof Installation, Built-up Reroofing, Built-up Roof Repairs, and Built-up Roof Maintenance in Marin County, Sonoma County, San Francisco and Napa. From residential flat roofs to industrial warehouses, Built-up roof systems (BUR) have long been the low slope roof solution in the San Francisco Bay Area. These custom-made roof systems are built on the roof deck providing a solid surface roofing membrane. Often referred to as “tar and gravel roofs,” the Built-up roof assembly consists of a base sheet with multiple redundant layers of fiberglass ply sheets mopped solid with hot asphalt. For added flexibility, Modified Bitumen ply sheets can be substituted for the fiberglass sheets. Roof insulation can be added benath the roof assembly to improve the thermal efficiency of the building and to add sloping to the roof when needed. The protective surface layer of a Built-up roofing system can be a layer of aggregate, slag or mineral granules to protect the roof from UV degradation. For a smooth surface, a finished layer of a Cool Roof Reflective Coating or a Cool Roof rated white cap sheet provides increased energy efficiency and complies with California’s Title 24 requirements. GAFGLAS® BUR helps to reduce installation costs while tackling the most demanding Built-up roof installations. GAF Ruberoid® membranes offer greater flexibility, impact resistance, strength, and system compatibility as an integral component of a GAF Built-up roofing system. 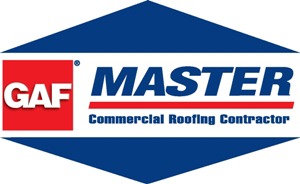 As a GAF Master Commercial Roofing Contractor our GAF Built-up roof installations qualify for GAF’s strongest warranties, including the Diamond Pledge™ - No Dollar Limit Roof warranty. If you have a flat roof and need a foam roof, I highly recommend Wedge! They did an incredible job repairing and ultimately replacing my roof destroyed by a solar panel install. They were incredibly professional and took care of my entire home and yard during the work.